Solar simulators allow for the accurate testing of solar cells, modules and panels to measure their conversion of light to electric current. There are two types of solar simulator: continuous and pulsed. Continuous simulators provide a steady illumination for a longer period of time; pulsed apply a flash type illumination of shorter duration. Both types are typically measured for spectral match, the amount of light produced; spatial uniformity, the consistency of the light output over the area illuminated; and temporal stability, the consistent output of light over a defined period of time. 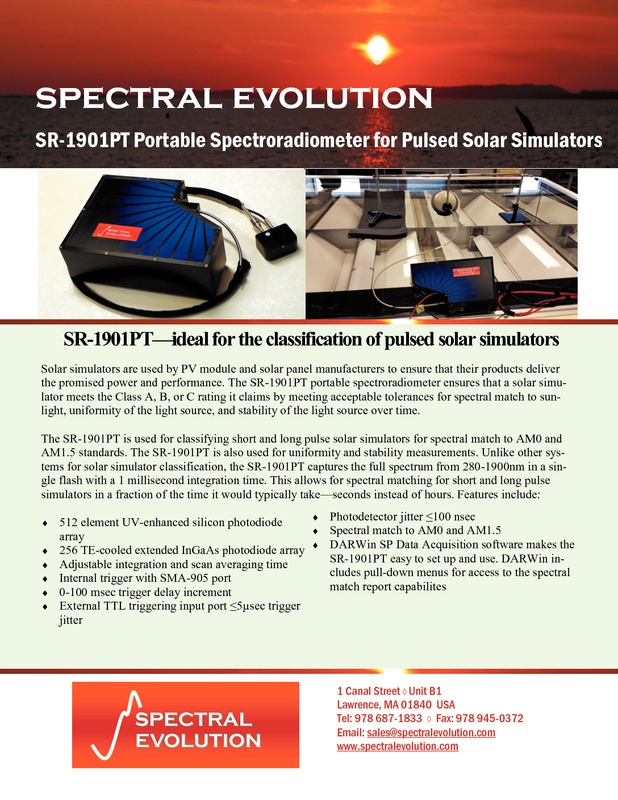 Spectral Evolution’s SR-3501 and SR-1901 provided testing of continuous solar simulators. The SR-1901PT and SR-2501PT test long and short pulsed solar simulators. Temporal stability and spatial uniformity are misnomers – the appropriate Spectral Evolution spectroradiometer is actually measuring the non-uniformity of irradiance over the physical area of the device under simulation and the instability over time of the irradiance. Measuring temporal instability requires different measurements depending on whether your simulator is continuous or pulsed. In addition two parameters are used: short term instability (STI) and long term instability (LTI). STI relates to the sampling time of a data set (irradiance, current, voltage) during an I-V measurement (current-voltage). The value of temporal instability may be different between data sets on the I-V curve and in that case the STI is determined by the worst case. LTI is related to the time period of exposure where the maximum and minimum irradiance depend on the application of the solar simulator. 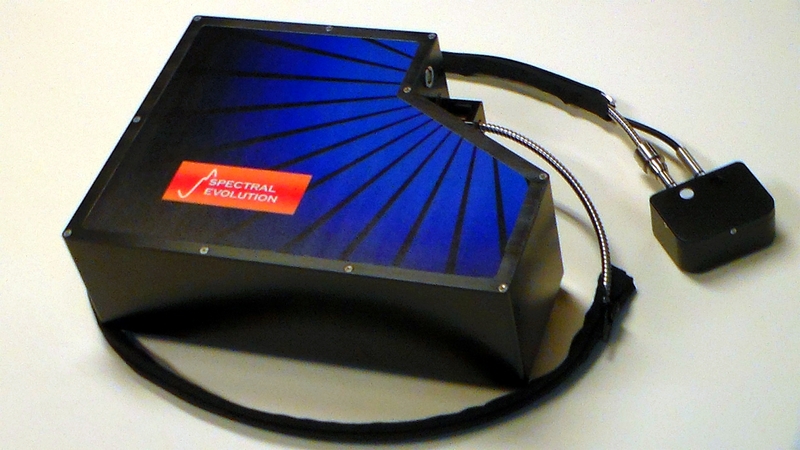 If the simulator is used for endurance irradiation tests, temporal instability is defined by the maximum and minimum irradiance measured with a detector at any particular point on the test plane during the time of exposure. The SR-3501 and SR-1901 can meet the requirements for measuring STI and LTI with a continuous (steady-state) solar simulator. The SR-3501 has a spectral range from 280-2500nm; the SR-1901 has a spectral range from 280-1900nm. The SR-3501 and SR-1901 spectroradiometers can classify continuous solar simulators to IEC and ASTM standards. The SR-1901PT and SR-2501PT classify pulsed solar simulators. The DARWin SP Data Acquisition software provides reports for measuring the simulator’s ability to meet class requirements. 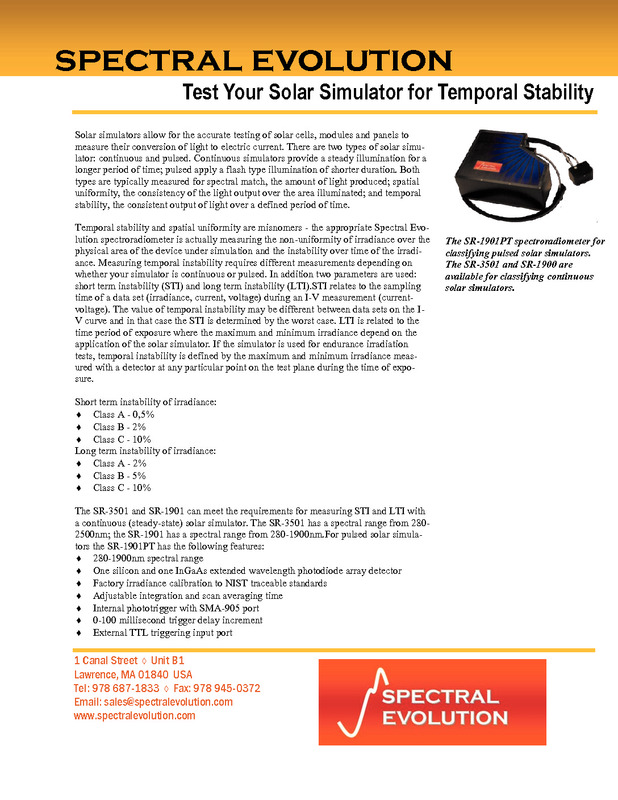 Download our Application Note on measuring solar simulator temporal stability.